Have you heard of chromium GTF before? 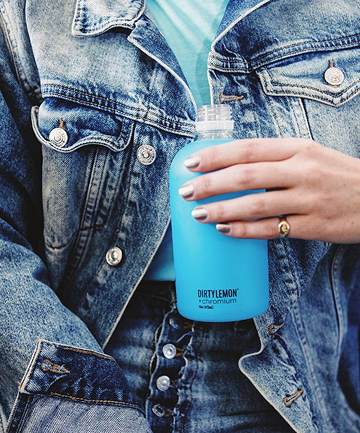 Well, uber-popular beverage brand Dirty Lemon — which is stocked at trendy retailers ranging from Chillhouse to Barry's Bootcamp, and happens to be a major disrupter with its own brick and mortar venture — is betting that its latest launch, Chromium Water is going to be the next big thing in the detoxing beverage space. While they're not the only ones pushing the benefits of chromium GTF, they are the first to push it in water versus in supplement form in a major, glitzy way. First, let's elucidate the basics: chromium is a trace mineral and "GTF" stands for "glucose tolerance factor." The dietary supplement is thought to help weight loss efforts: "Companies that sell Chromium GTF supplements/enhanced beverages claim that it helps with weight loss by curbing cravings for carbs and sugar and suppressing the appetite," explains Michelle Dudash, RDN, author of "Clean Eating for Busy Families." She quickly adds, however, that the research to date is inconclusive. "While chromium is an essential nutrient required by the body for metabolizing carbohydrates and enhancing insulin function, it isn't clear how much is required or if supplementation is actually beneficial for the average healthy person who isn't deficient." Curious? Keep reading to learn more about chromium GTF from top nutritionists and experts. SEE NEXT PAGE: How does chromium GTF work?